Zubik v. Burwell could have disastrous consequences. The latest challenge to the Affordable Care Act’s contraception mandate could have wide-ranging impacts. 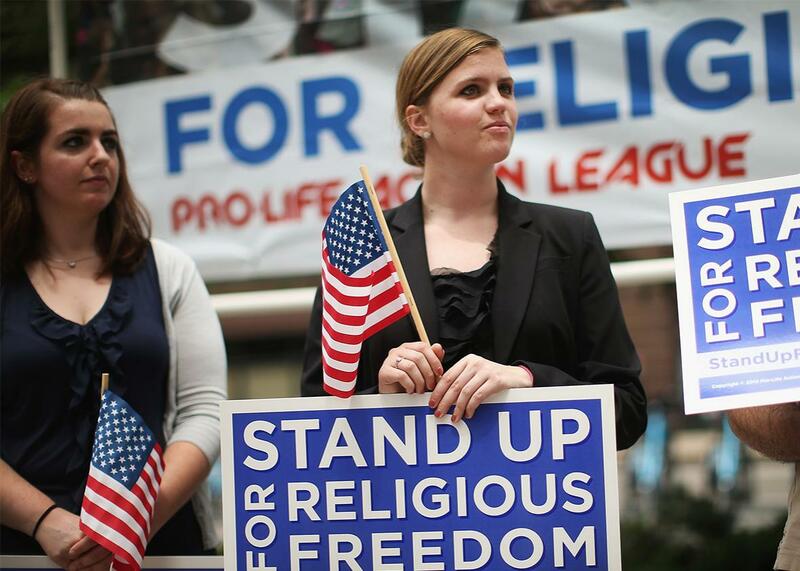 Religious freedom supporters at a rally to praise the Supreme Court’s decision in the Hobby Lobby case, June 30, 2014, in Chicago, Illinois. With Donald J. Trump filling all three rings at the circus these days, it might have been easy to miss that oral arguments in Zubik v. Burwell have snuck up on the Supreme Court. But Zubik, to be argued Wednesday morning, might be the most important case this term that nobody has heard of. The case is a follow-on to Burwell v. Hobby Lobby, the 2014 decision that first announced that for-profit corporations could have deeply felt religious convictions that supersede the medical wants and needs of their employees. Zubik is a case about religious objectors—in this instance religious nonprofits like schools and hospitals—who are unwilling to take “yes” for an answer. Their challenge is to the accommodation the Obama administration has offered them, which allows these organizations to avoid having to offer employees contraception to which they are entitled under the Affordable Care Act. The accommodation lets religious objectors send a letter or fill out a form setting forth their religious objections, so that they don’t have to provide coverage for birth control. Not only is this the Obama administration’s accommodation, it’s also one Justice Anthony Kennedy himself—providing the fifth vote for the corporate objectors in Hobby Lobby—blessed in that case. For all the folks who insist that the court can carry on just fine with eight justices because what could possibly go wrong, Zubik offers a pretty illuminating counterexample. If the court were to tie on this matter, the law would be one thing in some states and something else in others thanks to different rulings in various jurisdictions across the country—precisely the type of confusion Supreme Court review was designed to avoid. Millions of workers will be affected. They’ll be delighted to hear that this should all be resolved by 2021, when Republican senators finally decide to hold hearings to replace Justice Scalia. Because it’s a complicated case—a statutory challenge rather than a constitutional one—it’s easy to say Zubik isn’t as important as Whole Woman’s Health, the other big reproductive freedom case on this term’s docket. But in many ways Zubik is as important, not only because the challengers seek to override the medical needs of third-party employees but also because this challenge sets up a dramatic new effort to curb civil rights laws by way of religious veto. The result will not implicate merely birth control but also gay rights and racial discrimination. Thus the case has been brought under the 1993 Religious Freedom Restoration Act, which bars the government from imposing a “substantial burden” on the exercise of religious beliefs, but allows such burdens if the policy or program is “the least restrictive means” that the government could use to achieve a “compelling government interest.” Those are a lot of fancy-pants words to convey the message that this is a high bar to meet and the government usually loses, although the courts used to apply this test in a less stringent fashion. That is, at least in part, why the first seven federal appeals courts ruled against the religious objectors in Zubik (only the 8th U.S. Circuit Court of Appeals has ruled for them), determining in most cases that the notification system is not a substantial burden. Even University of Virginia professor Douglas Laycock, a staunch defender of religious liberty who wrote an amicus brief in support of the religious objectors in Hobby Lobby, has filed a brief on behalf of the government in this case. In a Washington Post op-ed Laycock noted that, according to the logic of their lawsuit, no form of accommodation could satisfy the religious employers. “[T]heir real objection is to what their secular insurers are required to do,” Lacycock writes. “The religious objectors demand a right to control how the government regulates insurance companies.” In part, the religious objectors are arguing that the government is conceding that its purposes can’t be all that compelling by offering an accommodation in the first place, which Laycock reasonably contends will deter future accommodations and imperil real religious liberty. But Laycock isn’t the only person with concerns about government religious infringement who has supported these types of accommodations in the past. In Hobby Lobby, Justice Anthony Kennedy joined the majority but wrote separately to say that the accommodation specifically at issue in this case is reasonable and religious objectors don’t have general veto power over other people’s rights. In one of the more interesting amicus briefs filed on the government’s side in Zubik, a group of military historians argues that the religious objectors’ arguments are inconsistent with the ways in which religious accommodation has long been understood. They compare these modern-day religious objectors to conscientious objectors during the Revolutionary War who were asked to—and willing to—pay a for substitutes to fight for them. “All … should have a free use of their religion, but so as not on that score to burden or oppress others,” said one prominent Pennsylvania minister at the time. The whole point of the ACA’s accommodation, these historians write, was to “promote religious liberty and respect the beliefs of religious objectors, without harming other essential interests—in this case, women’s interest in full and equal health care coverage.” Seems fair, no? The whole notion that the free exercise cause couldn’t possibly contemplate religious accommodations that actually harm third parties is the subject of another important amicus brief filed by Washington University in St. Louis professor Elizabeth Sepper. The argument is that exacting a toll from the female employees who do not share the religious beliefs of their employers is far beyond the scope of permissible religious freedom. It was these women who seemed invisible to the majority last time the contraception mandate was before the court in Hobby Lobby. It was painfully easy for the five justices who decided that case to ignore the burden placed by the religious objectors in the case, the Hobby Lobby store owners, on their workers—many of whom did not share their religious views and who relied on their employer to cover crucial preventative health care. This case is about religious freedom, yes. But it is also about American women who do not believe that the religious liberty of others trumps their statutory right to vital preventative care, including birth control. Some of the most interesting fights in America are playing out in the space between those two positions. It’s too bad we don’t have nine justices to hear this appeal. Hopefully we will have nine justices in the coming years, to hear the cases that are sure to follow.